ATS Suppressor Pouch is a MOLLE compatible design that will fit cans in the 7â€ length, 1.5 diameter range, such as the Gemtech Halo or AAC M4-2000. The pouch measures about 6 ½ inches long, about 2 inches wide, and is about 7 Â½ inches in diameter. 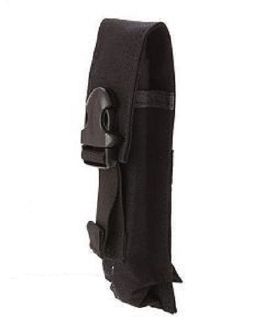 With the lid extended to the limit of the adjuster strap, the pouch measures about 10 inches long. The lid is adjustable by way of an ITW/Nexus Surface Mount buckle. ITW is the best hardware there is. The pouch uses one channel and 6 rows of MOLLE space and weighs just 2.4 ounces. ATS's suppressor pouch is made in the USA and available in black, coyote brown, Ranger Green, and Multicam. Like all ATS gear, it is covered by a lifetime warranty.